ZTE might not have much of a brand in the UK, but it sold over 90 million devices in 2010, making it one of the top five mobile manufacturers in the world. The ZTE LightPad range sees its first foray into the tablet market: with a 7-inch touchscreen running Android 2.2 it's not exactly at the top end of the scale, but ZTE has never been about being the technological best but about value for money. Value still indicates a need for quality though – we spent some time with the ZTE Light to find out if it's worth your money, however little it may be. The first thing to note is that we played with a device that was not the final hardware, so changes may be made before it hits retail. The other thing to take into account is that there are several versions of the tablet; this is the ZTE Light with a capacitive screen. There's also a resistive screen version (why? We've no idea) and an upcoming ZTE Light 2 which will feature a more powerful processor. The tablet isn't a bad looking device – the screen is large and bright but we can't fathom why the bezel is so asymmetrical. There aren't many buttons present, mainly what you'd expect: lockscreen and volume keys on the edge of the tablet. It's a bit of a funny place for the lockscreen button to sit as we automatically went to the top of the device every time, but if you're using it predominantly in landscape it may not be such an issue. 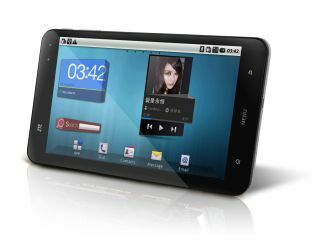 The ZTE Light features two cameras – a front-mounted one for video calling and a rear-mounted one for taking snaps. There's also a 3.5mm headphone jack, which is always a welcome addition. Charging and syncing is done using the microUSB port which sits alongside the external speaker. The 7-inch screen means this is a little on the unwieldy side, but you can just about hold it in one hand and operate it to a certain extent - realistically, you need to get both hands involved. It's a fairly light tablet to hold and the build quality isn't bad although we're not sure that all of the buttons are as sturdy as they could be – again, this could be due to being an unfinished build.